Dark River Derby Coalition, is currently seeking volunteers for it’s coaching staff! No skating experience is required. Knowledge of roller derby is preferred but not a requirement. We are looking for self motivated individuals with previous experience in coaching and sports team leadership. Duties include project collaboration and coordination within various committees to drive team skills, endurance and success. Strong communication skills are vital. Coaches are also expected to become full members of the DRDC league and adhere to league stipulations. Please consider joining our world recognized and ranked sports league right here in Quincy, IL! 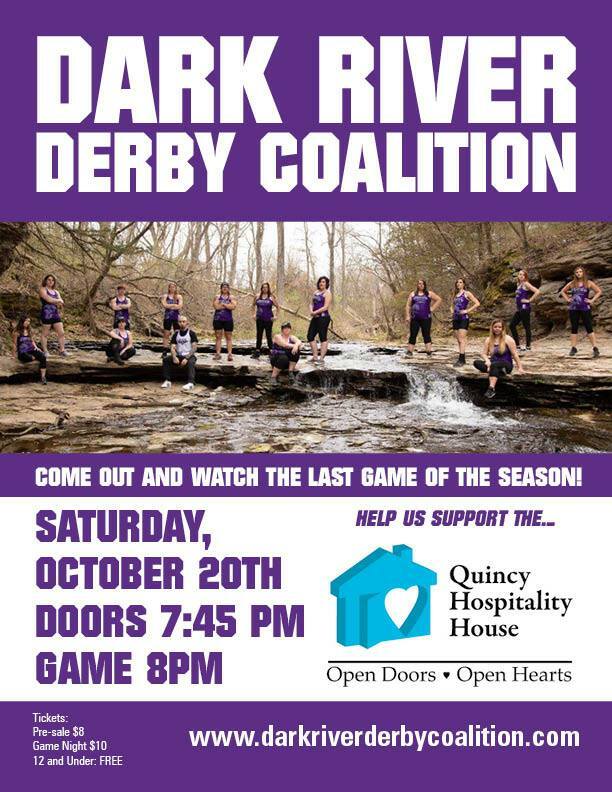 For additional information, please send us a direct message or email info@darkriverderby.com. May 12th – 2018 Series Opener! Are you ready for some Roller Derby?! Quincy, IL’s one and only women’s flat-track roller derby team is starting our 7th season with a bang on May 12th as we take on the Old Capitol City Roller Derby. We have spent our off season training hard and are ready to once show the community the pride and strength we have in our team. Please join us May 12th at Scotties Fun Spot (8000 Broadway, Quincy) to enjoy the roller derby action. Tickets can be purchased in advance at Scottie’s or from a DRDC member. Doors open at 7:30pm and the bout starts at 8:00pm! St. Patty’s vs. Easter Sunday Funday Mixer! Join the Dark River Derby Coalition at Scotties Fun Spot to celebrate spring with a morning of skate! bring GREEN and PINK shirt with number on the back. refs and NSOs needed and APPRECIATED!! Check out the Facebook event below!